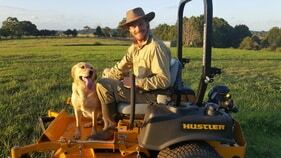 We offer our acreage lawn mowing services to property owners with large land areas. General property maintenance services for you own home or rental property. A well maintained garden and yard or property starts at the lawns, here at slash me silly we specialise in acreage/lawn mowing, with our fleet of hustler zero-turn mowers we can be sure to handle any job, big or small. At slash me silly me silly we also provide a free blowing service of your driveway and leaves so your garden has the optimum look after we have finished mowing, We also have machines that can specialise in steeper gradients, just fill out an enquiry form at the contact area on this page and we can have your free quote out you as soon as possible, or better yet, call Luke on 0429994189 for an estimate over the phone in just a few short minutes. Have a read of what our happy customers think of us.